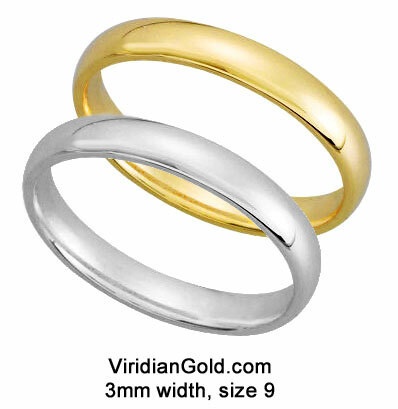 Many of our diamond rings at ViridianGold.com are made with a special type of mounting for the diamond, called an illusion setting. This type of setting was created to enhance the appearance of the diamond mounted within it. The diamond is surrounded by a white gold "platter" which contains ridges to catch and scatter the light into and out of the diamond. 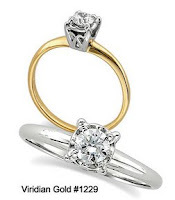 The prongs of the setting may be spaced to hold the platter as if it were a larger stone (with the diamond mounted on another set of prongs within the platter), or the prongs may support the diamond within the platter as shown at left. The first type is used in our Diamond Solitaire Engagement Rings #1229 illustrated below. The intention of such a design is to highlight the beauty of the diamond--a poor-quality stone will actually look worse in an illusion setting! Diamond pricing is directly proportional to the quality of the diamond, that is, its color, cut, and any impurities embedded within it (called inclusions). With an illusion setting, a ring with a high-quality, smaller diamond will look better than a ring with a larger, poor-quality diamond of the same price. Always place a greater emphasis on quality over size when purchasing a diamond--you won't regret it later! This type of setting can also be made in shapes other than round, such as shown below in our Religious Marquis Engagement Ring #1380. In this design, three diamonds are used, a larger one in the center and one in each half of the marquis shape. 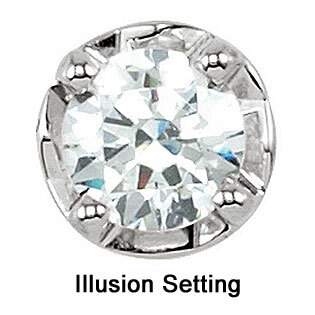 Illusion settings may also appear in pendants, bracelets, lapel pins and other diamond jewelry. For an engagement ring, a couple may select a ring with a nice diamond mounted in an illusion setting and, years later when they can better afford it, they can have the setting and diamond replaced with a larger stone. Also, many of our rings which are shown on the website with illusion settings may be modified to a traditional setting, so that we or the customer may supply a larger stone. As always, feel free to call or email us if you have questions about our jewelry. 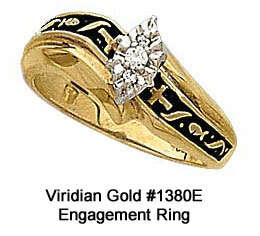 ViridianGold.com is a full service jeweler, so we can custom size and engrave your ring, too.